After missing the last three games and four out of the last five with concussion-like symptoms, senior Megan Van Tatenhove returned to the court Tuesday in a 67-63 victory against Sacred Heart. Despite going 1 for 4 and missing both her free throw attempts, Van Tatenhove grabbed a key rebound with under a minute that sealed a program-best 13th non-conference win. 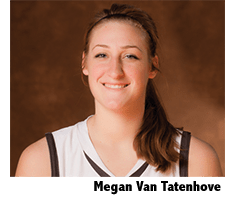 Van Tatenhove gave The Intrepid an exclusive interview about her health, the Atlantic 10 Conference and the state of the Bonnies. Posted on January 5, 2012 July 31, 2013 by intrepidsbuPosted in UncategorizedTagged Megan Van Tatenhove, podcast, sports, Tony Lee, women's basketball, xs.